I had earlier blogged about the cafes and the restaurants that we visited in Paris and the steaks and burgers and snails that we ate there. But what about the famous French desserts you might be wondering. Can I confess that we didn’t have any of the traditional or modern French pastries when in Paris? Not even the classic crème brulee, which K came back to Mumbai and said we should have had when we were there. What we did have in Paris when it came to desserts, were a lot of dark chocolate macarons and, some lovely dark chocolate cookies and crepes, and and I made a beeline for the hot chocolate too. Dark again. Or noir as they say. My wife, K, has always been the dark chocolate lover in the family while I would experiment with multiple flavours in desserts. They say that after a while couples begin to resemble each other. Well, of late I have begun to appreciate the joys of dark chocolate. 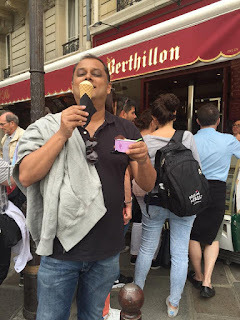 So, be it ice creams or macarons, dark chocolate it was for us in Paris. Both K and I are macaron lovers. Especially dark chocolate ones. So much so that for the last 4 years we have celebrated K’s birthday with a dark chocolate macaron cake every year from Pooja Dhingra’s Le 15 Patisserie in Mumbai. 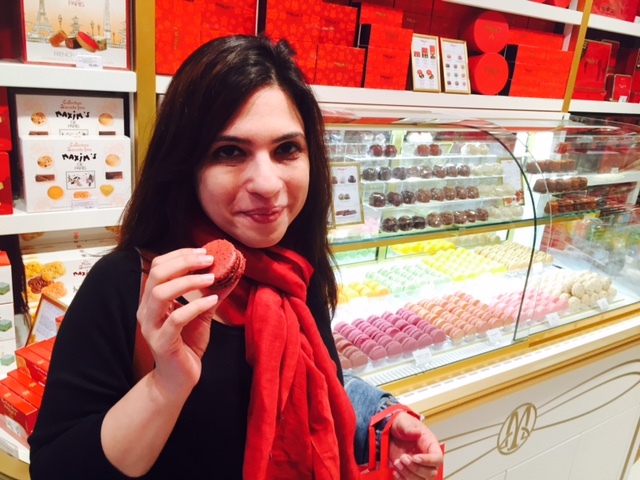 We tried macarons all over Paris during this trip, as we did at Cannes where were earlier. We tried macarons in the famous macaron shops of Paris and in small patisseries too and once at a food truck. Here's what followed. We went to the original outlet of the legendary Laduree at Champs D Elysees. Were we blown away by the macarons there? Were they life changing? Not really. They were not the best we had. Nor the worst. There were many buying macarons in an orderly queue on the ground floor. We sat at the café and had macarons with coffee (again not the best cappuccino in Paris) there. What we loved though was the sense of history that surrounded us while we sat in the outlet which had started in 1862 in Champs D Elysees and is said to have sparked off the macaron craze in France. 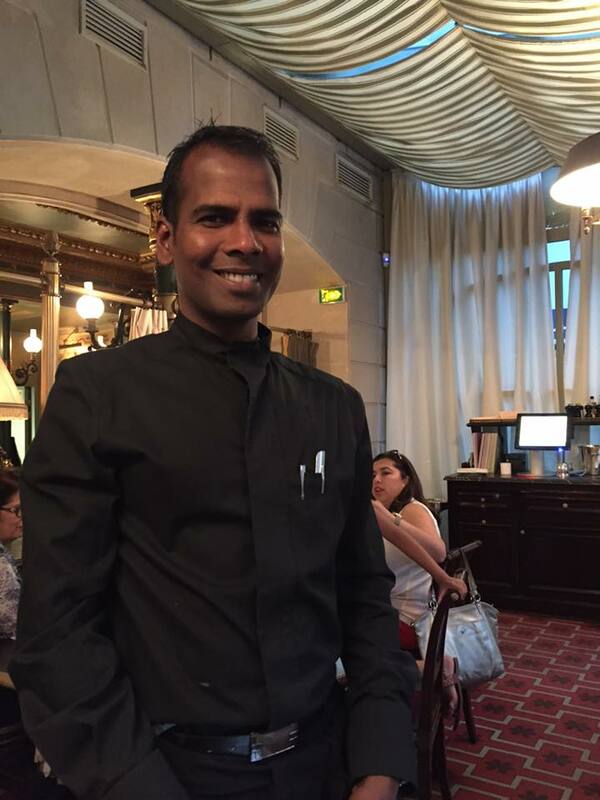 Talking to the smiling Sugu from Chennai, who is part of the wait staff here and who had moved into Paris years back from India, was a fond memory from our visit. What I found really good at Laduree was the dark chocolate cube that they serve with the coffee. K bought me a slab of it to take home and I had one cube per night at Mumbai to get over my Paris hangover. We had a nice macaron at a Boulengerie opposite Café Lux and at a couple of Boulengeries at Marais including at one beside Falafel Du Liban (lovely cheese sambuccas and beef sandwiches there). Climbing up to the Sacre Coeur church at Montmartre was daunting as the roads were pretty steep. Its architecture was indeed inspiring. I am not big on sightseeing though and the most memorable parts of our trip to the cathedral were the sausages that we had outside the cathedral and then our stop at the small Maxim’s outlet after that. 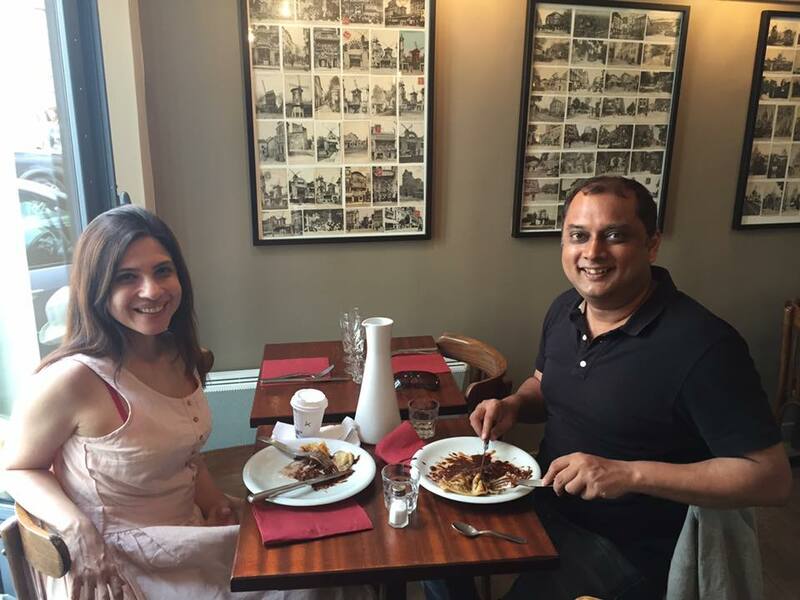 The original Maxim’s restaurant in Paris is 120 years old according to the friendly girl attending the small shop. The shop at Sacre Couer had macarons, chocolates, jams and foie gras tins. We got a dark chocolate back home to Mumbai and it turned out to be really good. We had the dark chocolate macarons at Maxims. They were so impressive that we went for seconds. The dark chocolate filling in the macaron was pretty pure and genteel. The meringue casing had a bubbly surface which made the texture really interesting. If you spot a Maxim outlet then you would find it worth your time to spot there. We felt really fortunate when Le Cordon Bleau Paris and Atout France India organised a private macaron making class for the two of us at the academy. 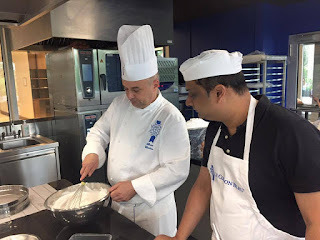 Chef Olivier, who conducted the class, was witty, engaging and knowledgable, spoke good English and the class left us very enlightened about our favourite dessert. Incidentally, the chef made fruit macarons here and not chocolate ones but they tasted superb and we finished them all in the hotel later. K, unlike her mom, is not a hot chocolate fan but I made up for her mom’s absence when it came to the hot chocolates in Paris. Here are the most memorable ones though I had some other nice ones at the local cafes too. ‘I know you are not much into desserts (not entirely true), but you guys must go to Angelina for the dark chocolate,’ my friend Khushboo messaged me when I landed in Paris. K and I dutifully headed there on our second evening at Paris. We reached at around 6.30 pm, just before it closed for the evening. “Lunch, breakfast, tea, that’s enough people,” explained our waiter with a smile when I asked him why Angelina shuts so early. I realised what he meant when we went tried to got to Angelina again on our last evening at Paris which was on a Sunday. There was a snaking queue to get in which spilt across to the next street and we didn't even bother trying to join it. Luckily we got a seat at Angelina on our first visit. Angelina, was founded in 1903 and is now run by a company which has opened many Angelina outlets across the world. We went to the original one at Rivoli. 113 years is a lot of time to perfect the art of making a good hot chocolate and their expertise showed in the cup of hot chocolate that I had at Angelina. The chocolate was intense and not too sweet. The consistency thick enough to envelop you in its goodness and yet not too thick. It was served with a pot of fresh cream that my mom in law would have loved. I am not a whipped cream fan and tried some of the chocolate without the cream and some with it. It tasted better without the cream but I am biased. I know that Teddy would have added the cream. K had an orange juice. The ambience was really classy. The service warm and not intimidating at all. A place to go to feel good about life. Our visit to Fouquet was unplanned and it was suggested to us by a new friend we had made that day and who was with us. I had a huge sneezing bout during a day when we went into the French countryside. When we returned to Paris, we got off at Champs D Elysees, and our friend suggested that we go into Fouquet's for aperitifs, or an evening drink. Our friend, an Indian settled in Paris, had a wine, K had the cappuccino and I had the hot chocolate. At 10 euros, it was more expensive than the 8 euro hot chocolate at Angelina. 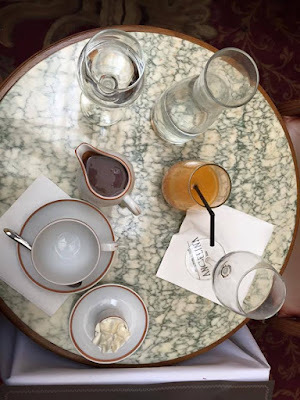 I found the quality of the chocolate at Fouquet's even more intense and the texture of the drink more silken than that at Angelina. The hot chocolate at Fouquet's fixed my cold and made me smile like I should have done earlier itself on such a beautiful day. Fouquet's is apparently around 150 years old and was the first café to open at Champs D Elysees. Yet, it is so well maintained and classy after all these years. Our friend Shehnaaz told us that the former French President, Sarkozy, had apparently stopped here when he was on his way to his first official engagement after becoming the president much to the consternation of the French citizens. I could relate to that. I would have stopped first at Candies if had become the president of anything. The Candies Chicken Sandwich Lovers Club perhaps. They call ice creams glace in France. We had some pretty wonderful ice creams in Cannes and Nice. At Paris, Oliver of the Joke Hotel told us to go to Berthillon on hearing that we were going to the Notre Dame that afternoon. 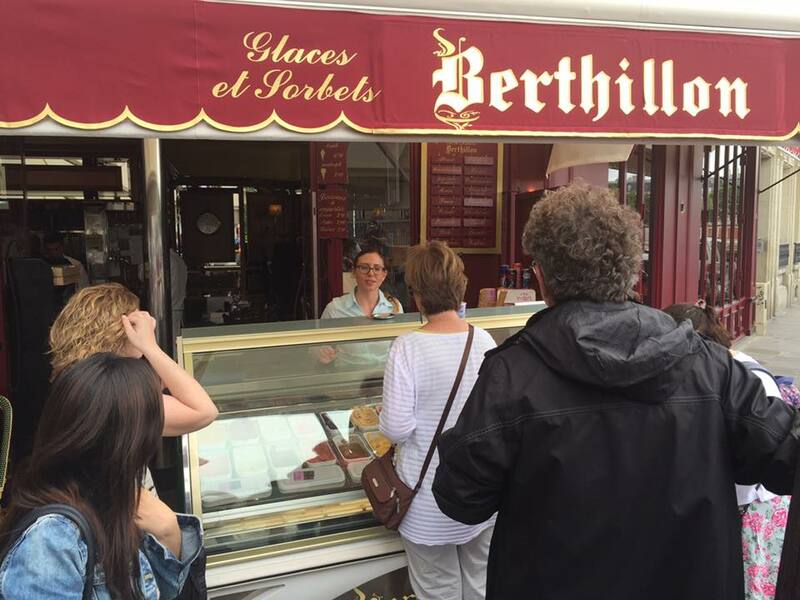 “Best ice creams in the world,” he told us. The Notre Dame, which I had seen as a baby earlier, is indeed impressive but the Berthillon ice creams which I had later were what I found truly memorable. 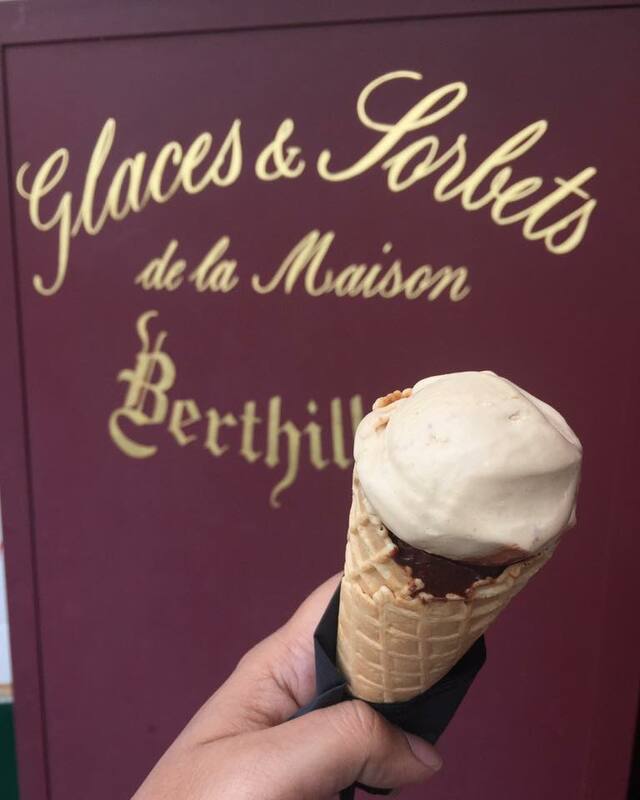 Berthillon is a restaurant located by the river with an ice cream counter for those who wanted to just buy ice creams and move on. We stood in a longish queue for our ice creams. When we reached the counter we found the lady at the counter to be friendly and patient despite the large crowd waiting for ice creams. She spoke in English, answered our questions with a smile and offered us tastings too. K and I both settled on settled on a combination of a scoop of a very creamy cookies and cream and a very deep and dark and brilliant chocolat noir. 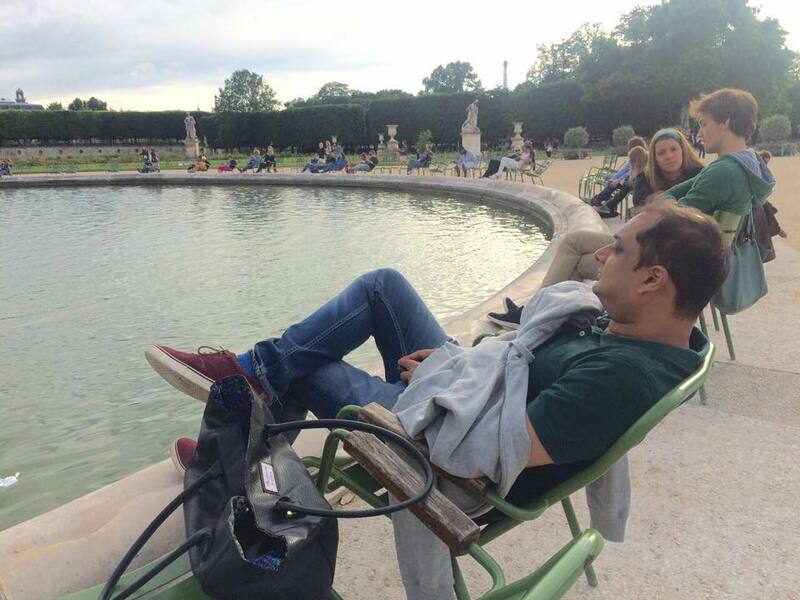 We sat by the banks of the Seine and enjoyed these masterpieces. Two tiny scoops were 5 euros but then one doesn’t come to the Notre Dame every day or have such soul nourishing ice cream. 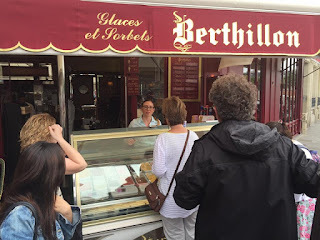 We later saw that a few other cafes stocked Berthillon ice creams. We went to an outlet of the popular Amarino chain for ice creams too at a pretty locality called Marais. This shop was crowded too, but once again, as it was everywhere else, the staff was very friendly. I thought I would give the chocolate some rest and try flavours such as lime and balsamic and organic strawberry. The cone that they made me looked quite pretty. It tasted ‘interesting’. I think I am now fully a dark chocolate person! We had bought biscuits in the Madrid outlet of La Cure Gourmande in an earlier visit. There was an outlet near Angelina and we we went there a couple of times and had lovely cookies there. You pick your cookies from the boxes there, get them weighed, pay and eat. You can buy cookie boxes too. We bought some nice cookies for our flight. They had good stuff in chocolate and other flavours too. These were pretty simple, old school cookies and were pretty buttery. Vintage grandma's baking stuff. 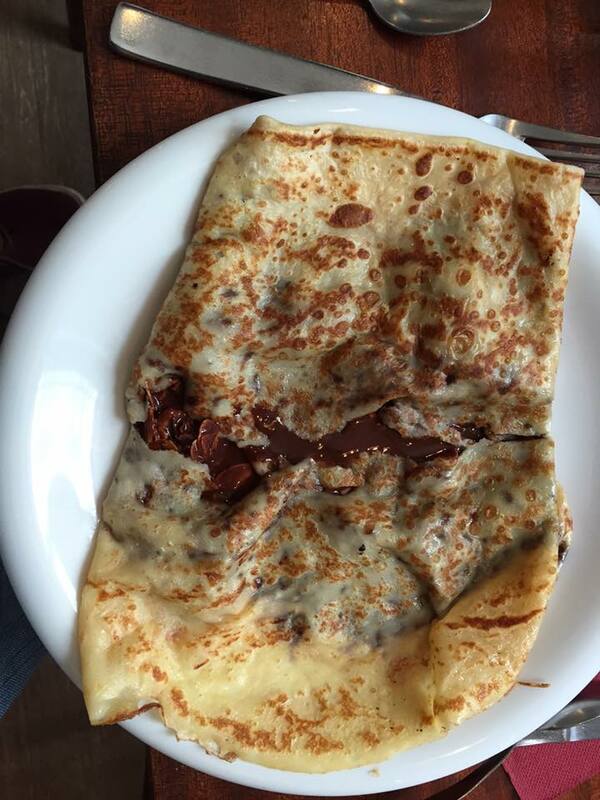 You get crepes across the streets of Paris. As we saw at Lepic at Montmartre, the crepes made fresh in the restaurants could be far superior even if more expensive. The simple dark chocolate in a refined flour crepe that chef Ludovic made for us was all about the quality of great chocolate with the gossamer thin and delicate buttery crepe giving the perfect foil. So, if you are a devotee of dark chocolate then be assured that Paris will look after you, and remember, this is just a sample of what's on offer.